The uncertain political climate in Washington, D.C. has Nevada officials guessing the future of Yucca Mountain. The Nevada Commission on Nuclear Projects recently discussed how a current situation in the U.S. Congress could affect the future of the decades-long battle against a proposed nuclear waste repository. “We usually could see a rather united Republican front on appropriations bills, but that seems to be shifting as we sit here,” said Michon Mackedon, vice chairman of the commission. Former U.S. Sen. Richard Bryan and chairman of the commission said it’s not clear whether the House of Representatives will move on any appropriation measure. There’s an ongoing dispute over the total amount of the federal budget for fiscal year 2017 for 12 appropriations bills between the Republican majority in the house and a group of members in the Freedom Caucus, a congressional caucus that is made up of conservative Republican members of the House of Representatives. “In a perverse way, that may help us because the appropriations the house wants may not come about,” Bryan said. 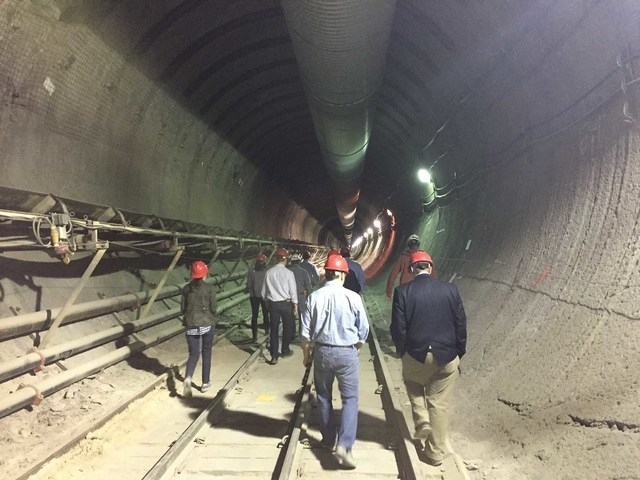 On April 19, the House Appropriations Committee adopted a fiscal year 2017 energy and water development appropriations bill that provided $150 million for the nuclear waste disposal program and $20 million for the Nuclear Regulatory Commission to continue the adjudication of Department of Energy’s Yucca Mountain license application. The bill also denied the administration’s funding proposals for non-Yucca nuclear waste initiatives. GOP leaders of the House Appropriations Committee, including senators Thad Cochran of Mississippi and Lamar Alexander of Tennessee, have supported the nuclear waste site. Nevada Agency for Nuclear Projects Director Robert Halstead said for a variety of reasons, it’s unlikely that the Senate and the House of Representatives will pass energy and water appropriations bills. Halstead said the Congress will likely pass a continuing resolution as it did for the past five years. The move would mean that the amount of money appropriated for each agency is the same as it was in previous year. No money for Yucca Mountain licensing has been passed since fiscal year 2010. “A continuing resolution is more likely than a series of 12 appropriations bills passed by both houses and signed by president before Oct.1,” Halstead said. On Thursday, the Senate approved a $37.5 billion bill to fund energy and water programs in 2017. The bill is the first out of 12 spending bills that lawmakers have to approve to keep the government functioning. The bill that was passed by the Senate however must be reconciled with a version of the bill that was passed on April 19 and is being considered in the House of Representatives. The bill that was passed by the Senate doesn’t have any money for Yucca Mountain. If the two bills pass, a conference committee will have to work on a compromise. After that, both houses may have to vote again, before the bill goes to the president. If the House of Representatives passes a pro-Yucca bill, the rules in the Senate would allow Sen. Harry Reid and Dean Heller to prevent any Yucca money in a compromise bill, Halstead said. All 435 members of the House of Representatives are up for re-election this year. Additionally, 34 of the 100 senators are up for re-election too. Darrell Lacy, director of the Nye County nuclear waste project said if Yucca Mountain is not safe, Nye County will not support it. Lacy urged Nevada officials to see the science. “If it is not safe then we will not support it. That is the directions myself and other county employees and contractors have received from the County Commission,” Lacy said. U.S. Sen. Harry Reid, now a minority leader who has been a major force behind keeping Yucca Mountain funding at bay retires this year. Some officials in Nye County pin hopes on changing situation after Reid’s exit. “Now that Harry Reid is leaving, his political games will end. It remains to be seen if Congress will fund Yucca moving forward,” Lacy said.